Now that my son is fourth grade level, we have let go of copywork. That said, it is still important to practice handwriting. Writing cards to family and friends is a sneaky way we get handwriting practice in his life! My main requirement is that his handwriting be neat and either in printing or in cursive. His writing must also use the correct case and a uniform line height. Sometimes he writes things on his own, but he knows that I’ll comment on mixed case writing or slanted writing. Now that we no longer do regular copywork for school, he has become more consistent in writing nicely when he chooses to write cards or notes to family and friends! This weekend he had a birthday party to attend, so he had to write a birthday card. It’s amazing how even writing a simple birthday card can be great handwriting practice. I also have given him a template to use with primary-grade lines. He especially used this when he was younger and wanted primary-grade lines. Download the blank template instantly by clicking the button below! As he writes a card to a family member or friend, he practices forming letters. He practices putting words together and keeping them uniform. The style of handwriting is now up to him, but he wants his recipient to understand the message so he has added interest in making it more legible. See more ideas for getting kids to practice handwriting. Copywork never made sense to my son. He did not see the point of it, and since handwriting itself was so emotionally difficult (dare I say “painful”? ), it was all the more frustrating for him. He’s glad that it has gone from our daily curriculum. I’m glad I can still add writing letters to friends and family on the list as handwriting practice for him. Want to see more ideas for how to sneak learning into your children’s lives? 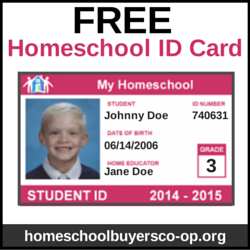 See the blog hop at iHomeschool Network. Did you like this post? Please pin it for later!